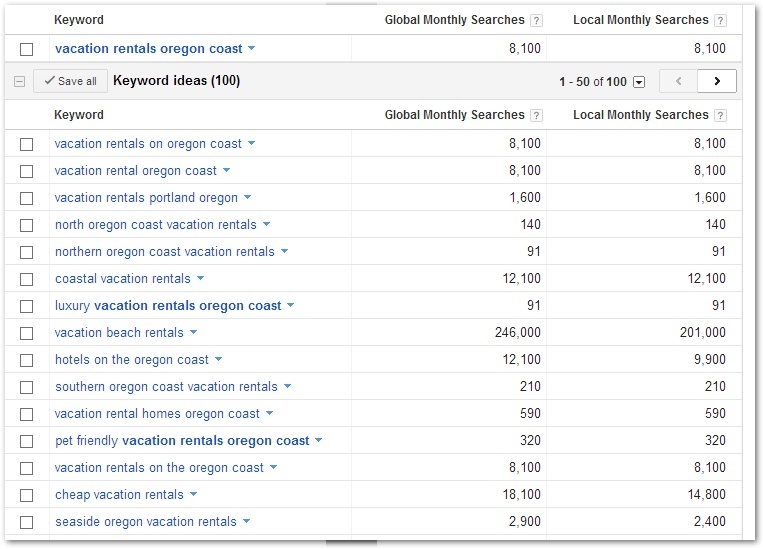 Many vacation rental managers think they need to rank high for major search terms for it to have a significant impact on their businesses. But, with the high traffic brought in by major search terms also comes high competition. While ranking high for major search terms is doable, it takes a lot of work. An easier, alternative strategy is to focus on long-tail search terms. For those that don’t know, long-tail search terms are generally longer and more specific queries that generally get less traffic. However, these search terms also have less competition and are easier to rank for. It may take ranking on page 1 for 10 long-tail search terms to get as much traffic as ranking on page 1 for one major search term, but sometimes it’s easier (and faster) to rank for the long-tail terms. And, because you’re ranking for a more specific query, your chances for converting that traffic (getting a booking) are much higher. But how do you rank for these long-tail terms? One quick way to is publish blog posts targeting the long-tail terms. Writing a blog generally involves far less effort than creating a new landing page on your website, and blogging platforms like WordPress.com are generally SEO friendly. In the rest of this blog, we’ll lay out a quick guide for how to do this step by step. Now that you have an idea of some terms you might want to rank for, head over to Google and see what your competition is like. 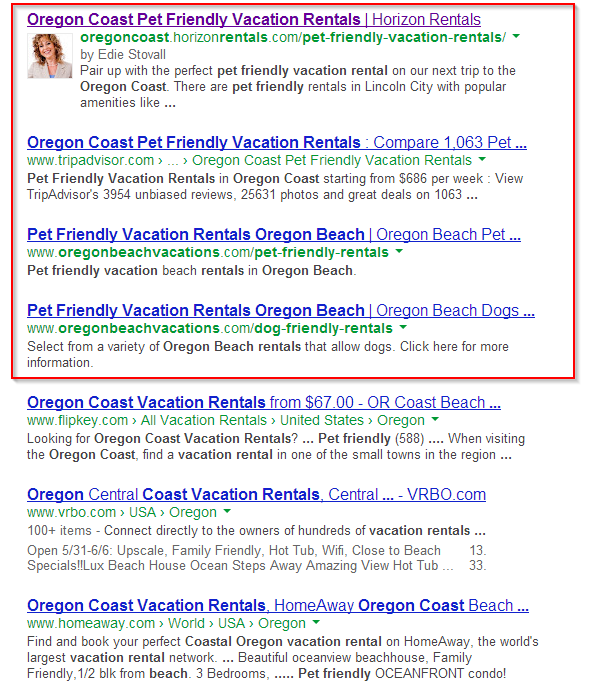 A quick search for the long-tail term “pet friendly vacation rentals Oregon coast” shows that only the top four listings in the organic results are really geared completely to this search term. The remaining results just mention the word “pet friendly” somewhere on a page about Oregon coast rentals. Scanning the competition here, it looks like there might be an opportunity for someone else to compete for this result with a blog or landing page geared to this specific term. Now that you have a term you’d like to target, it’s time to blog about it. You’re No. 1 purpose any time you write a blog should be to provide valuable content that will help your readers. So, keep that at the forefront of your mind when writing. Try to put yourself in the searcher’s shoes. What will they want to know? You’ll also want to position your keywords in the right places. Make sure your keywords are in your headline. The headline will likely show up as the H1 heading on your page, and blogging platforms like WordPress.com will also include those words in the URL structure. Make sure your keywords are in the text of the blog, but don’t over-stuff your copy with them (just write naturally). Make sure your keywords are in your photo captions and in your alt tags. Make sure you use the keyword in your tags (and even potentially in your categories). The whole purpose of getting people to this blog is to convert them into guests. In order to do that, you’ll need to provide them with an avenue to make a booking. So, make sure you have links from this blog pointing back to your website. Using the example above, make sure that some of these links are links to pet friendly homes within your inventory. Also include a phone number or email address, as that may be a preferred method of contact for some guests. Make sure you share your post on your social media channels and link back to it any time you get a chance. Social signals are beginning to affect search results and the more links you have pointing back to your article, the more likely Google and other search engines will find it important. In certain circumstances, you may want to write multiple blogs targeting the long-tail term to really showcase your expertise. In fact, doing this you may even be able to rank multiple times on the front page. 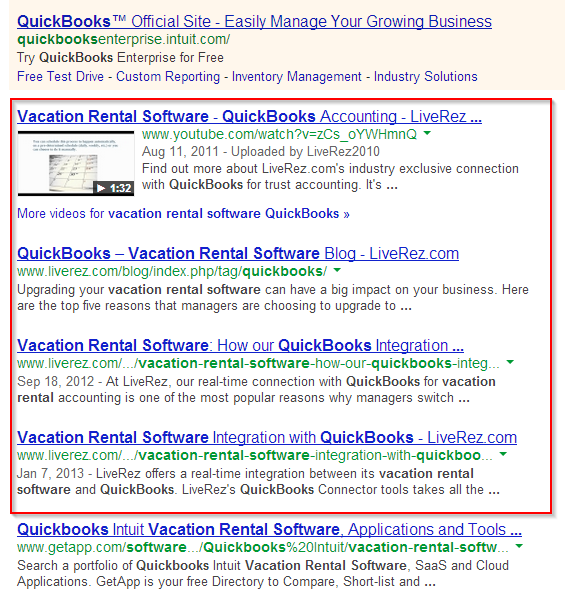 Check out how LiveRez has used this strategy for one of its targeted long-tail terms (vacation rental software QuickBooks). You’ll notice that the top 4 organic search terms are all content from LiveRez, and three of them are from the LiveRez blog. That’s not bad for a non-branded search term. Don’t get discouraged if you don’t rank on the first page right away. Creating content is like planting seeds. What you create and post will have a long life online. And, as more people come across it, it’ll get more traffic, more links to it and higher placements in search rankings. Do it right, and you’ll be reaping the fruits of your labor for years to come! If you’re interested in learning more about LiveRez, check us out at LiveRez.com. We also offer our partners a professional SEO program for vacation rentals, which helps them further optimize the industry’s most SEO-friendly websites.